There were plenty of death metal bands which formed in the early '90s, but couldn't manage their debut with ideal timing to join to the large wave of underground music in time. One of these late arriving bands was Mangled. Even though "Ancient Times" is definitely an old school death metal album, it's late timing could be sensed by it's more diverse musical features. The influence of Sinister is evident, but the band also liked to experiment with other styles (like doom metal for instance, but the open-eared listener may find more mainstream influences too) and to involve melodies. The brutal old school start ends up with some already modern death metal impression. In general "Ancient Times" souns like the mix of Sinister and Apophis, their musical concept was similar to what early German death metal bands did. They tried to put sumeting new and refreshing-like into the ordinary old school sound. The lyrics are far more interesting too, introducing horror and gore in life, mostly in relation with religious and historical references. That reminds to the late lyrical concept of Death, and they also formed a positive message between the lines. 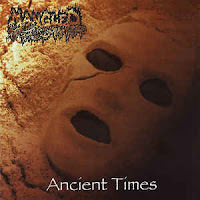 Mangled was like one of the last convulsions of the once remarkable Dutch undergound metal scene.